I used Dishie yarn, and I am so glad I did. Dishie is 100% cotton, and it hangs so nicely. It’s very soft, but keeps it’s shape very well. Click over the Knit Picks to check out the colors. 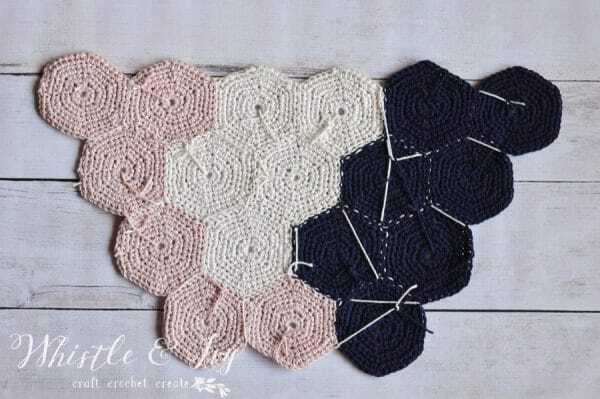 To begin, click over here to get the Simple Solid Hexagon pattern. 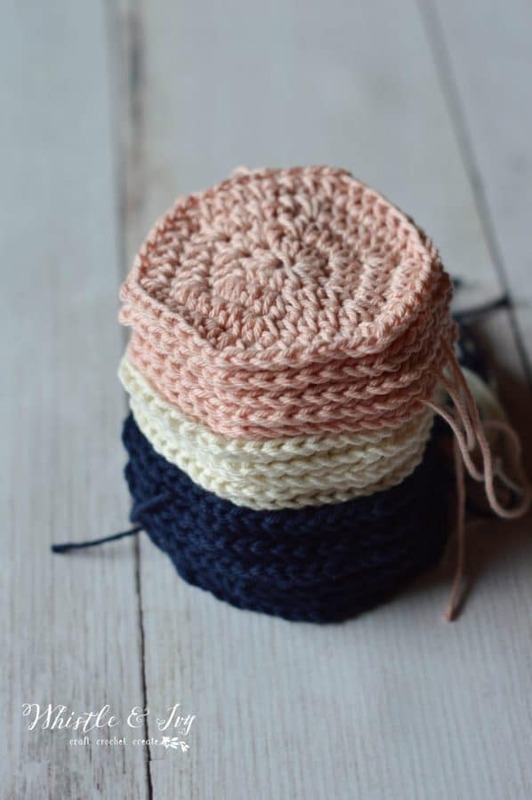 These are the three colors I chose for my wall hanging: Navy Blue, Cream, and Blush pink. You will need to make make 18 hexagons. 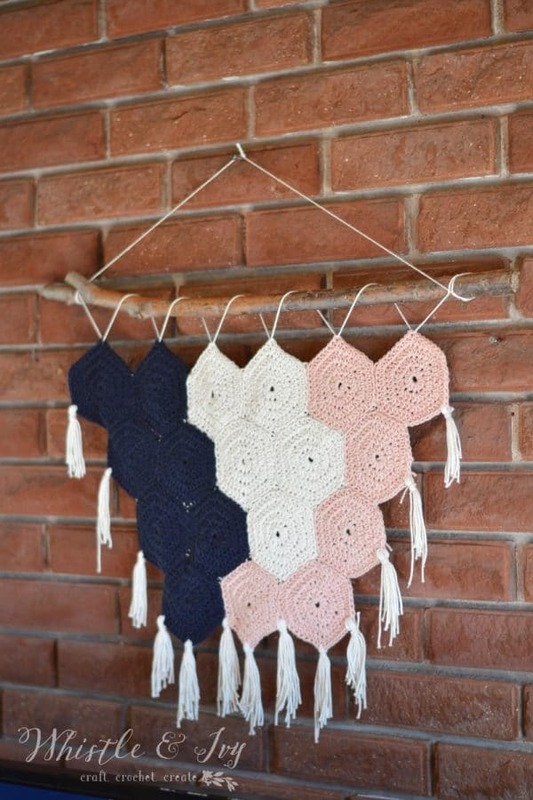 To follow the color scheme of the pictured wall hanging, you will need 6 Blush, 5 Cream and 7 Navy blue Hexagons. Be sure to lay out your pattern, making sure you have made enough, and it looks how you would like it to look. Next, you can start sewing your hexies together. 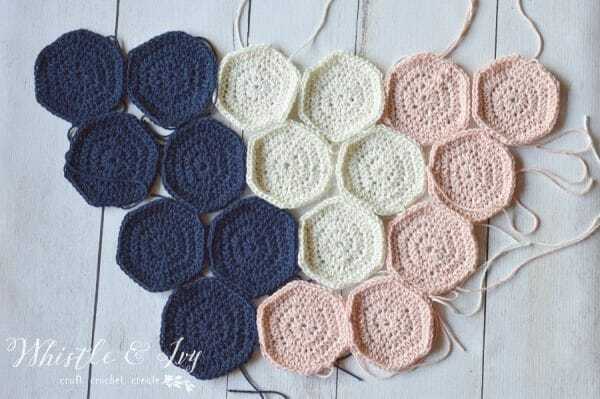 Sew them with RIGHT sides together, and go through the back loops on both hexagons. When the hexies are faced right sides together, the back loops will be the 2 loops on the outside. I used a running stitch, but you are free to attach them together any way you prefer. Sewing the hexies doesn’t really doesn’t take too long once you get going. If you can, plan your sewing lines so you can go from one to the next without cutting your yarn too many times. You won’t be able to do it with one strand, but you can avoid too many cuts by planning ahead. The back will look a bit messy, but that’s okay. You won’t be able to see it when you are done. 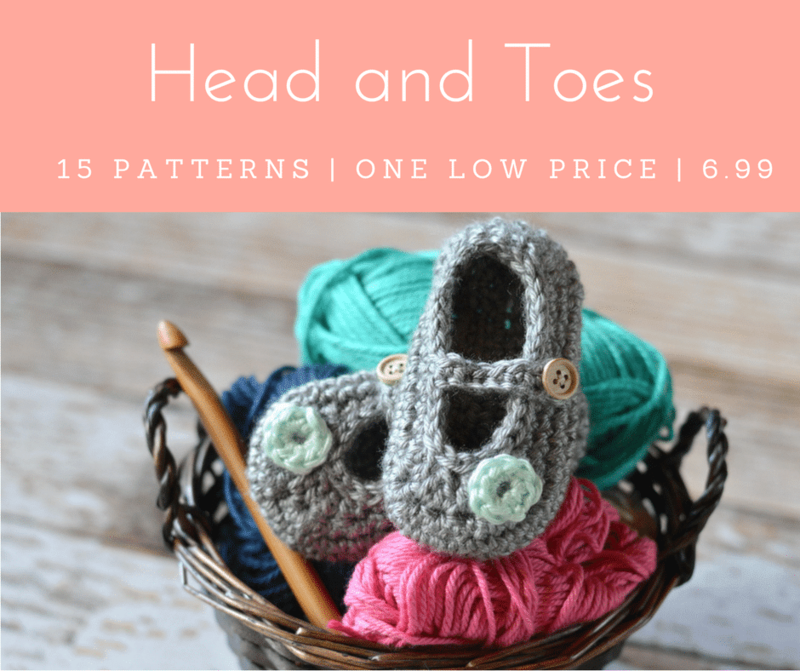 And don’t waste time weaving in your ends! Take 2 minutes and tie the ends together with a sturdy knot. It’s much faster and weaving-in is not necessary on this project. Next, you can start adding the tassel fringe. 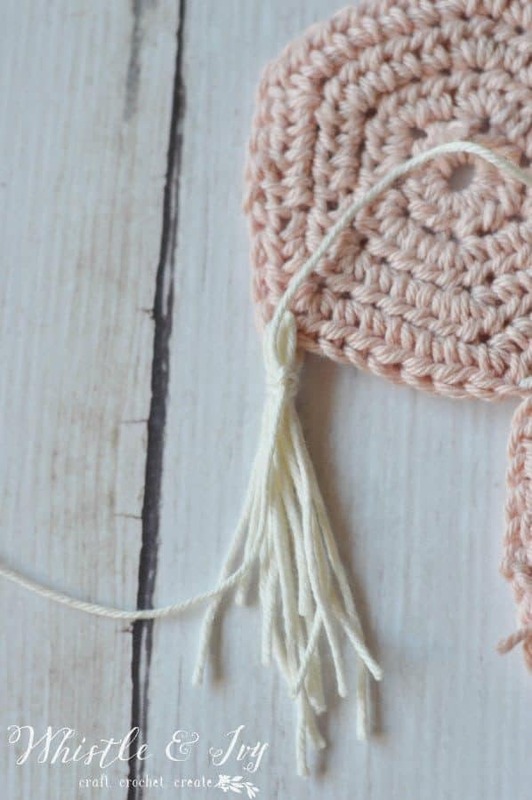 To make each tassel, wrap some yarn around your hand 6-7 times. Pull it off your hand and cut the bottom. Pull the yarn through each corner. 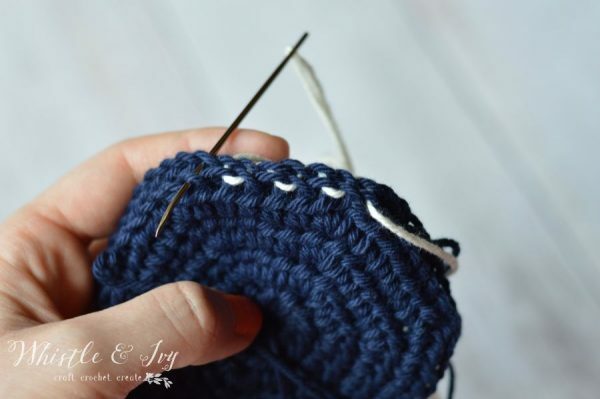 On the bottom, pull yarn through the space where to hexagons meet as well as the corners. Tie them into tassels by wrapping a length of yarn around the top. Turn your piece so you are working from the back. 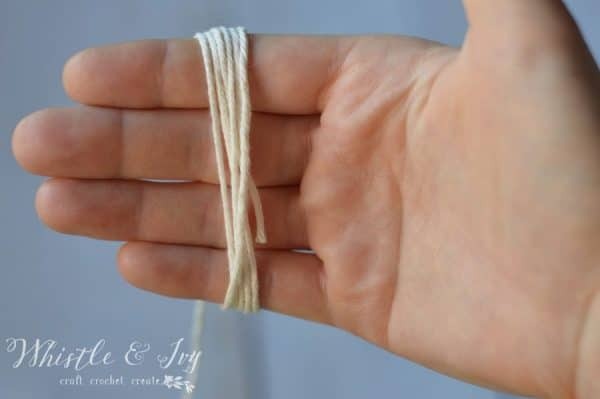 Pull the ends of the knot up and down to tighten so the tails can be hidden easier. Once all your tassels are tied, you can attach your hexagons to a branch or stick. My yard has a never-ending supply of branches, because my neighbor has a weeping willow that hangs over our fence. My husband and I don’t love it, but sometimes it works out well for me! 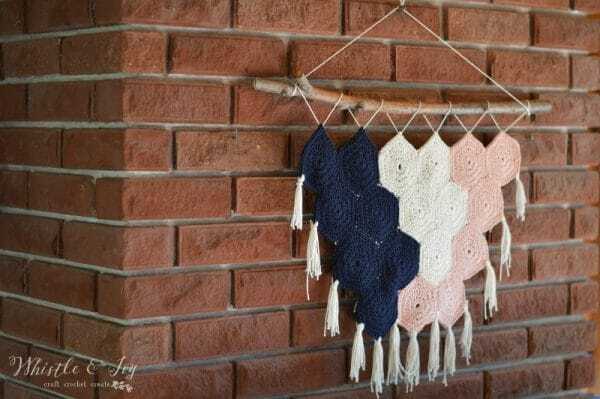 Use your darning needle and sew a length of yarn around the stick, catching the top corners of your hexagon wall hanging. Be sure to leave enough extra to tie a knot at the top to hang it from. Finish by hanging it up somewhere so everyone who visits can comment on your new, pretty wall hanging. 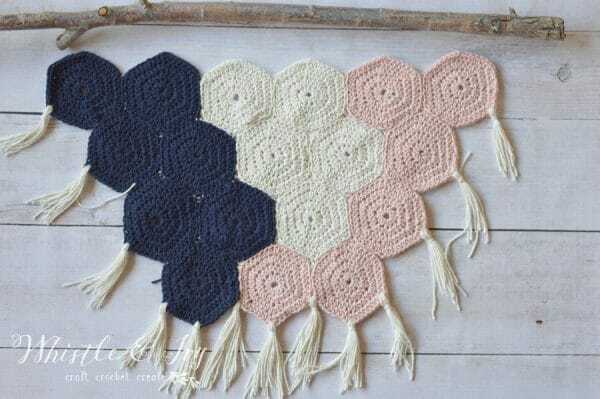 Love this Boho Hexagon Wall Hanging? Be sure to subscribe to Whistle and Ivy so you don’t miss anything! 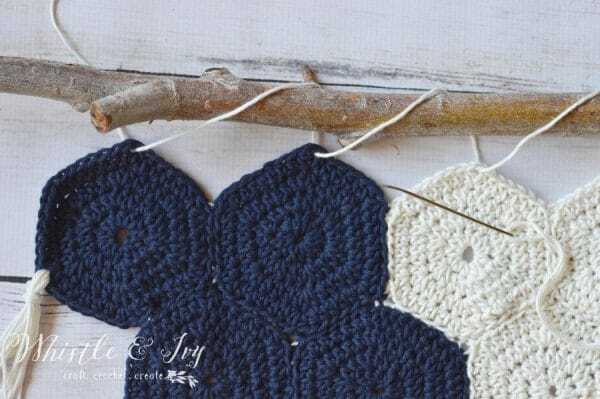 Join the Whistle and Ivy Facebook page and show off your projects. For inspiration and behind-the-scenes, follow me on Facebook and Instagram. Love, love, love this! Just made one for my newly remodeled bedroom and it’s beautiful! Yay! I am so glad you love it! I love this! Did you put a clear coat sealant on the branch? I didn’t! My branch was fallen from a willow, so it was very smooth. 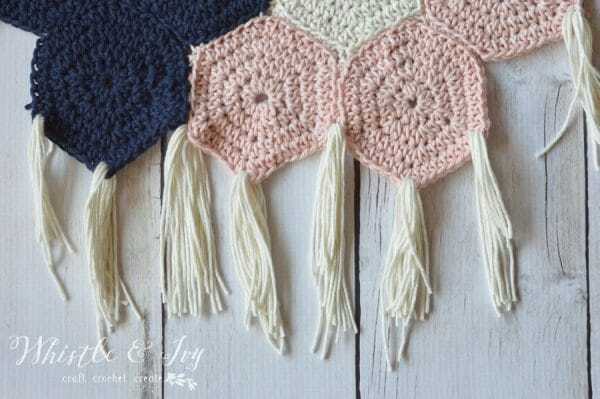 This is the cutest crochet decor I have ever seen! Pinning to my crochet board! 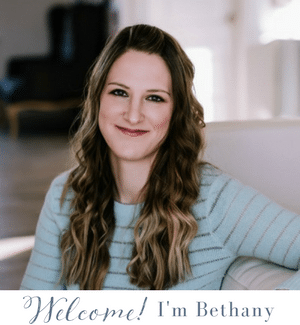 Thanks for linking up at the #HomeMattersParty ! What a great wall hanging! Pinned and tweeted. Thanks for sharing at Merry Monday, hope to see you again next week! I come across your patterns all the time on pinterest and always love them! I only just realized that they’re all from the same place lol. This is beautiful, thanks for sharing. Haha! Thanks so much <3 <3 You are very welcome!